The popular BBC2 program Saving Lives at Sea will show many dramatic and some maybe not so dramatic, rescues! However, what it does not show are the many hours of training the volunteer crews are required to complete, (training that is not without its own dangers). 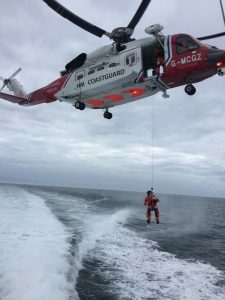 An example of this is a recent training exercise with HM Coastguard. When new crew members experienced for the first time the complex procedures of working alongside the HMCG team in casualty evacuation. The Salcombe Lifeboat Fundraisers held their annual street collections in Salcombe, Hope Cove and Kingsbridge recently raising an amazing £994.33. 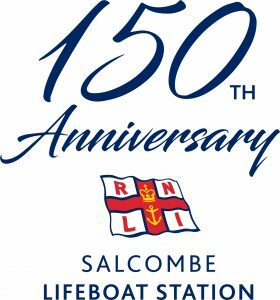 A special thanks goes not only to the volunteer fundraisers for giving their time but also to the local communities who continue to support the volunteer Lifeboat crews of Salcombe. 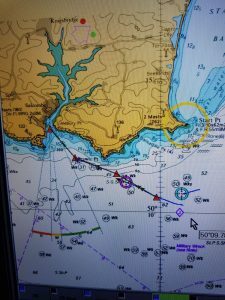 On Friday 13 July, RNLI Salcombe launched both the all-weather lifeboat and inshore lifeboat, to reports of medical incident on the rocks near Gammon Head. Once on scene and alongside the rocks two volunteer inshore lifeboat (ILB) crew were able transfer to the rock to assess the casualty’s condition. 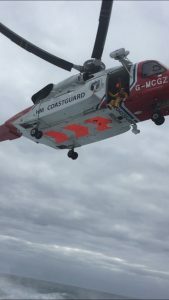 Upon examination the volunteer crew, both with casualty care training, confirmed the casualty had sustained back injuries consistent with those of a heavy fall on rocks and was in considerable pain. 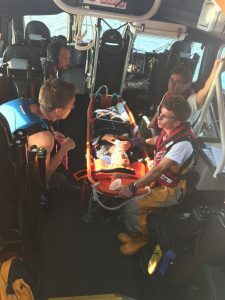 To help stabilise and secure the casualty, extra resources were obtained from the all-weather lifeboat (ALB), including a basket stretcher, pain relief and another crew member. 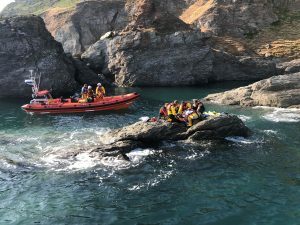 Once stabilised the crew were able to execute a smooth transfer of the casualty from the rocks to the ILB and then on to the ALB for continued casualty care and return to shore. Upon arrival into Salcombe Harbour the casualty remained onboard the ALB awaiting the arrival of an ambulance for onward transfer to Torbay Hospital. http://217.199.187.64/salcombelifeboat.co.uk/wp-content/uploads/2016/06/salcombelifeboats1.png 0 0 RNLI Admin http://217.199.187.64/salcombelifeboat.co.uk/wp-content/uploads/2016/06/salcombelifeboats1.png RNLI Admin2018-07-16 19:52:332018-07-16 21:45:03Salcombe RNLI respond to medical emergency. A message today from the winners of the RNLI Salcombe Fundraisers 2017 Grand Raffle. 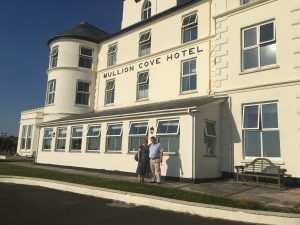 “Here as promised are some photos to record our fabulous visit to Mullion Cove Hotel. We have had a wonderful time. We are so lucky not only to have won but to have had glorious weather…almost too hot for exploring”! Tickets for the 2018 Raffle are now on sale. Available from the RNLI Salcombe museum and shop and various other shops within the town. 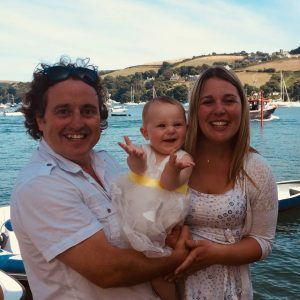 Sunday 24th June 2018 was a very special day for RNLI Salcombe Mechanic and eleven year veteran Sam Viles and his wife Paula. 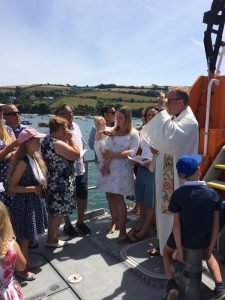 For Salcombe Lifeboats it was a honour to host the Christening of Sam and Paula’s first child Iris, aboard the Salcombe All Weather Lifeboat, The Baltic Exchange III. Best wishes go to Sam, Paula & Iris from the Crew at Salcombe Lifeboats. Regrettably, an urgent operational task has resulted in HMS SUTHERLAND being committed elsewhere and she will not now be able to join the flotilla of six lifeboats for the wreath-laying ceremony at 1215 on Thursday 27 October. A small arms detachment from the Britannia Royal Naval College, Dartmouth has, however, agreed to step into the breach and fire a 13 gun salute from 5.56mm rifles as the wreaths are laid – one gun for each soul lost; they will fire from a position in the gardens of “The Bolt” at South Sands which will be open from 11:45am. A Maritime and Coast Guard Agency rescue helicopter will also now join the lifeboats for the ceremony. Although a disappointing development, SUTHERLAND’s absence will not detract from the principal aim, that of an appropriate commemoration of the disaster 100 years ago this week. 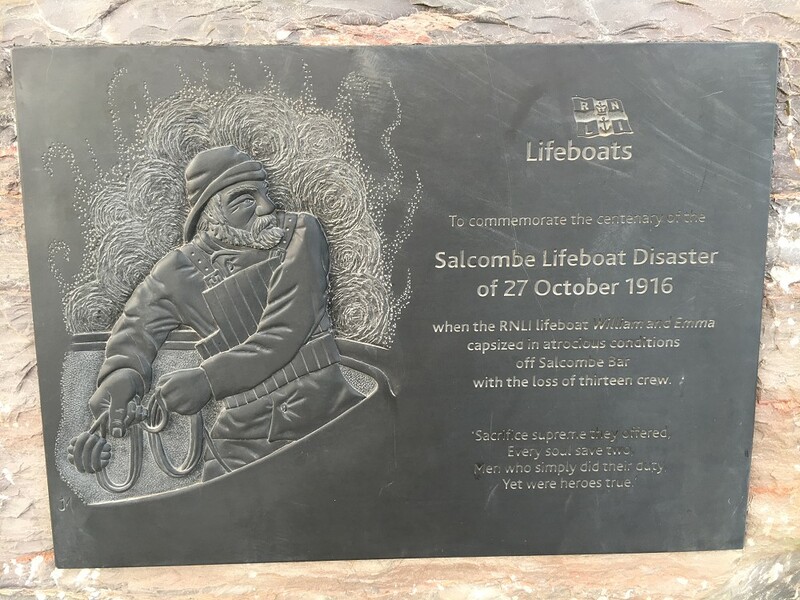 Salcombe RNLI have arranged two large Memorial Stones to be placed on each side of the mouth of Salcombe Harbour overlooking the position where the Lifeboat capsized in 1916. One of the Stones has been brought into Salcombe and is currently on display (until about the end if September) before going to its permanent site on the coastal footpath. 10:00 am : Service of Commemoration in Holy Trinity Church Salcombe led by the Bishop of Plymouth, the Rt. Rev. Nick McKinnel. All are most welcome to attend. During the service a “maroon” will be fired from the church tower to signal the beginning and end of a two-minute silence. The Bishop of Plymouth will also dedicate a plaque as a permanent memorial to those who perished in the disaster. 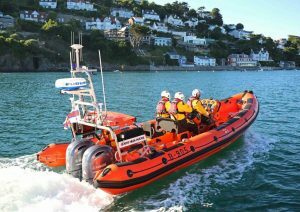 12:15 pm : Wreath laying at sea from “The Baltic Exchange III”, Salcombe’s All Weather Lifeboat, in the vicinity of the Bar; “Joan Bate”, Salcombe’s Inshore Lifeboat and the Plymouth All Weather Lifeboat , will also be in attendance. • City of Bradford III (served on the Humber 1954-1977 and Lytham St Annes1978-1985). • Samuel & Marie Parkhouse (now named Onoros) (served in Salcombe 1938-1962). • Mary Irene Miller (served in Port Patrick 1989-2011). After the ceremony all participating lifeboats will process up the harbour to Whitestrand. Boat owners are welcome to witness the wreath laying ceremony from the water, we do however request that you remain a respectable distance from the main ceremony and do not impede the passage of the small flotilla of lifeboats as it makes its way to and from the event. Mrs Angela Yeoman has kindly agreed to open her garden at “The Bolt”, South Sands from 1145 to those who wish to watch the wreath laying ceremony from the shoreline. (The Bolt is the penultimate house on the left on the road from South Sands out towards Overbecks & Bolt Head). 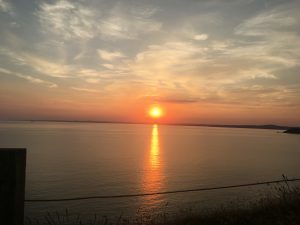 Parking will be very limited and it is hoped that those who are able will park at North Sands and walk to South Sands. There will be some spaces available at the car park of the ex Tides Reach hotel. Entry to the gardens at the Bolt is at your own risk as the owner cannot accept responsibility for any loss or injury. 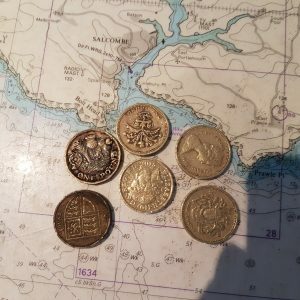 14:45 hrs : Talk/Presentation/Film show in Cliff House for reserved for the descendants of the 1916 crew and guests of Salcombe Lifeboat Station (by Invitation only). NB: This is the same talk/film as will be presented at other times during the summer – see “Talks and presentations”.